Download your very own Divezone Underwater screensaver! Recently, I went searching for a scuba diving or a fish tank screensaver with tropical fish for my computer but I couldn’t find any! The screensavers I found were either demo version or fake ones that seems to be freewares but in reality are full of spywares or adwares. So… I decided to create my own screensaver with some of the best underwater pictures in my collection. So here it is! You can download it for free by clicking on the link below, either in .exe or .scr file. These amazing photographs were taken by the famous french underwater photographer Yann Hubert who I had the chance of meeting for a few days in Rangiroa, French Polynesia in the Pacific Ocean. 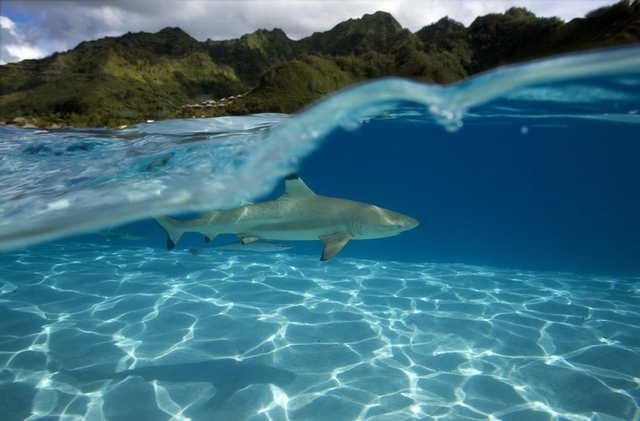 These include shots of Hammerhead Sharks, Dolphins, Turtles, Silvertip Sharks as well as Blacktip Reef Sharks in Moorea Island. Oh yes one more thing, sorry but these only work for Windows currently (Windows XP, Vista and 7) and not for Mac… And okay it is not in 3D but at least these are real tropical fishes! Instructions: Download the .scr file on your computer from the link above (this might take a few minutes as all photos are HD quality!). Then do a right-click on the .scr file. In the menu, click “Install”. Done! Feedback: I would love to hear your feedback. Let me know what you think in the comments box below ;-). If you are also keen on diving wallpapers to get you inspired, check out our selection of best underwater wallpapers! If you also have links to other aquarium, fish tank or underwater screensavers, add them in the comments section! Awesome screensaver!! Have just downloaded it! Thank you Alex ;-). Yes pictures are great! It’s so beautiful! I like it and I like other fish screensavers such as Digital Aquarium Screensaver. Where was this picture of the shark taken? Beautiful green landscape behind! Cheers! It was shot in Moorea Island in French Polynesia. Awsome place! Julian, I liked browsing through your site, very interesting. My friends and I started our own page, trying to share our diving and travel experiences with others. Therefore thank you for your effort. I’ll keep coming back. And if I have any questions about places you’ve visited, now I know who to ask. Cheers and happy, save diving. Be sure you copy the file from the C:\Download folder to C:\Windows. It should show up as the choice free-underwater-screensaver in the Screensaver settings. If for some reason you don’t find it in Downloads you can do a search for *.scr and find where it is and other scr files that Windows uses for screensaver’s.